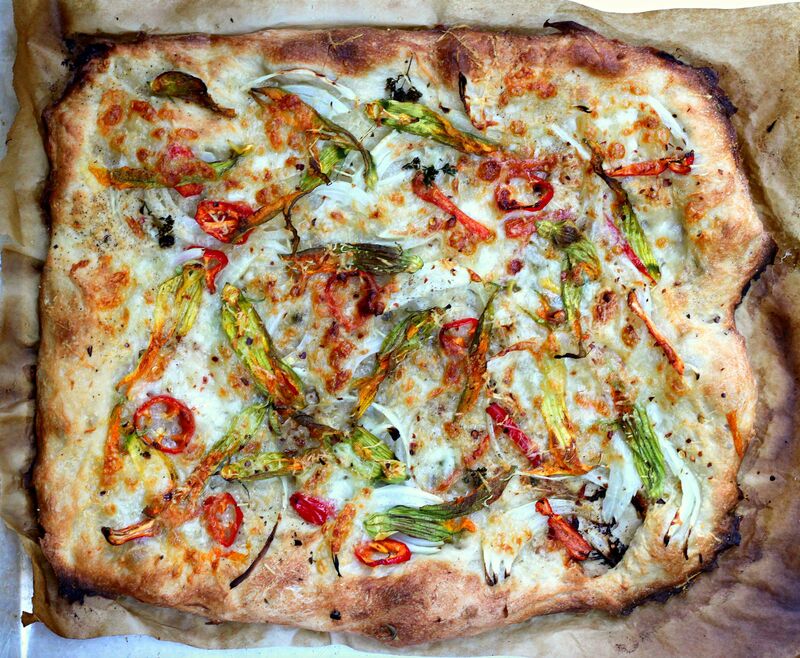 Squash blossoms might make this pizza sound pretty fancy, but it really isn’t. Delicate squash blossoms are everywhere at the farmers market at this time of year. I’ve been eyeing them, and contemplating ways to easily incorporate the floppy, sunny flowers into a meal. I’ve eaten blossoms fried and stuffed, but to be honest, I find them time consuming to prepare and often oily and rich. So I decided to simply layer them, with no other preparation, on a white pizza – or a pizza with no red sauce – and see what happened. The results were resoundingly good and a unanimous hit at the dinner table. The flowers shriveled and crisped while cooking, which concentrated their subtle and nutty flavor, which was nicely rounded out by sweet Jimmy Nardello peppers, onions, and a kick of heat from crushed red chili flakes. These fragile squash blossoms may be delicate, but it’s clear that they are no shrinking wall-flower. For this recipe, you can make your own dough or purchase a good quality fresh dough from your supermarket, which is a simple shortcut for an easy meal. This recipe stretches one pound of fresh dough into a large rectangle, but you can also shape it into 2 smaller pizzas. 1. Preheat the grill for indirect cooking over high heat (about 500°F for a gas grill) and preheat a pizza stone for at least 15 minutes. (Or preheat the oven to 500°F. Place a pizza stone on the lowest oven rack and preheat for at least 15 minutes). 2. Whisk the oil, garlic, and a pinch of salt in a small bowl. 3. Stretch the dough out as thinly as possible and lay on large pizza peel (or rimless baking sheet lined with parchment). Lightly brush with the oil. Sprinkle half of the Pecorino over the pizza. Top with the onions and peppers. Arrange the squash blossoms over the vegetables, and then place the mozzarella around the squash. Sprinkle the oregano, chili flakes and pepper over the pizza and lightly season with salt. Top with the remaining Pecorino. 4. Slide the pizza onto the pizza stone. Close the grill lid and grill until the pizza is golden brown, about 15 minutes. Remove and brush the crust with some of the oil. Drizzle any remaining oil over the pizza. Cut into serving pieces and serve immediately. The title of this recipe might make this pizza sound pretty fancy, but it really isn’t. Squash blossoms are everywhere at the farmers market at this time of year. I’ve been eyeing them, contemplating ways to incorporate the floppy, sunny flowers into a meal. I’ve had blossoms fried and stuffed, but to be honest, I find them oily and heavy (at least the ones I’ve tried). So I decided to layer them into a “white” pizza (with no red sauce) and see what happened. The results were resoundingly good and a unanimous hit at the dinner table. 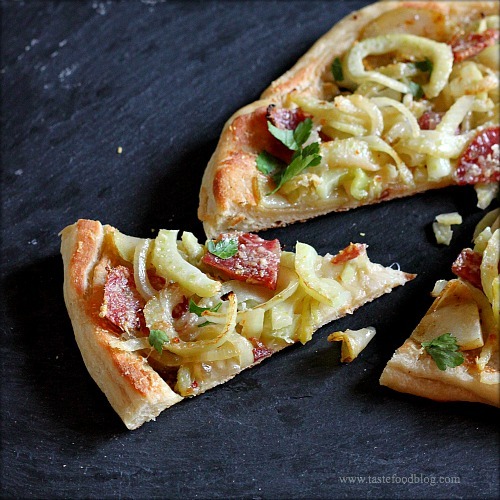 The flowers added a subtle, nutty flavor to the crisp and cheesy pizza, rounded out by the sweet Italian peppers, onions, and a kick of heat from crushed red chili flakes. It’s very clear the squash blossoms may be delicate, but they are no shrinking wall flower. Make your own dough (recipe here), or purchase prepared dough. For quick dinners I often purchase good quality dough ready to form from my supermarket. For family meals I stretch one package into a large rectangle, but feel free to shape it into 2 smaller pizzas. Makes one (10 x 15-inch) pizza. 3. Stretch the dough out as thinly as possible and lay on pizza peel (or rimless baking sheet lined with parchment). Lightly brush with the oil. Sprinkle half of the Pecorino over the pizza. Top with the onions and peppers. Arrange the squash blossoms over the vegetables, then place the mozzarella around the squash. Sprinkle the oregano, chili flakes and pepper over the pizza and lightly season with salt. Top with the remaining Pecorino. I’ll get right to the point. The star of this pizza is the tapenade, which teams up with oily fiery Calabrian chiles in a smashing combination. 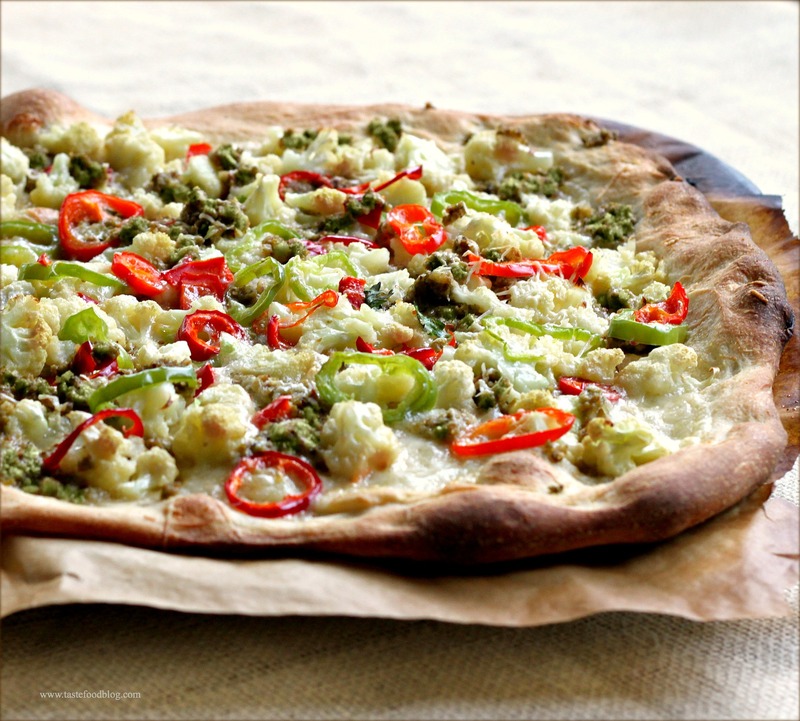 Sprinkled over roasted cauliflower, fresh peppers and creamy mozzarella, this is one fresh and feisty pizza. The tapenade is so good, you might find yourself munching spoonfuls straight from the bowl, smearing it on a piece of bread, or swiping the prepped cauliflower through it before you have a chance to assemble the pizza. So make a double batch – then you can have your nibbles and eat your pizza, too. Calabrian chilies may be purchased in the Italian specialty section of your grocery store. When selecting the fresh chile peppers for the pizza topping, try to select a variety of sweet and hot to your taste. Be sure to taste each pepper before using, as the heat will vary from pepper to pepper. I used an Anaheim and a mild Fresno pepper on this pizza. Serves 2 to 4. Preheat the oven to 500°F (or prepare the grill for direct cooking over high heat) and preheat a pizza stone on the lowest oven rack or on the grill grates. Toss the cauliflower and sliced peppers with 1 tablespoon olive oil and 1/2 teaspoon salt in a medium bowl. Thinly roll out or stretch the pizza dough to desired shape on parchment paper. Lightly brush the dough with olive oil and lightly season with salt. Scatter the mozzarella over the dough, then spread the cauliflower and peppers over the crust, keeping a 1/2-inch border all around. Scatter the calabrian chilies on top, then evenly sprinkle the pecorino cheese all over the pizza. Slide the pizza onto the preheated pizza stone. Bake until the cauliflower is tinged, the crust is golden brown and the cheese is bubbling, 13 to 15 minutes. Transfer the pizza to a cutting board. Drop teaspoons of the tapenade over the pizza. Drizzle with a little olive oil. Sprinkle with lemon zest and black pepper. Serve immediately. Flatbread or Pizza? And what’s the difference? I had these questions in mind when I made this pizza, er, flatbread, for an easy weeknight dinner. While the difference could simply be semantic, there is a theory that a pizza has a sauce, while flatbread doesn’t. Of course, I’ve made plenty of pizza-flatbreads with no sauce and called them white pizzas, so what do you think? I decided to label this recipe flatbread, and for the sake of further differentiation (and extra crunch) I used a different method for cooking the dough by pre-cooking it on a skillet then flipping it before adding the toppings and finishing it in a hot oven. The result is a crisp and golden crust for the bubbly melty toppings. It’s a flatbread, and I’m sticking to it. Finocchiana is a traditional Tuscan salami flavored with fennel seed. Whisk 2 tablespoons oil and garlic together in a small bowl and set aside. Heat 1 tablespoon oil in a 12-inch oven-proof skillet (preferably cast iron) over medium high heat. Add the fennel, onion, 1/2 teaspoon salt and the crushed red pepper flakes. Saute until the fennel and onion begin to turn golden brown at the edges, 4 to 5 minutes. Transfer to a plate. Wipe out the skillet with a paper towel. Do you have a grill? Do you love pizza? 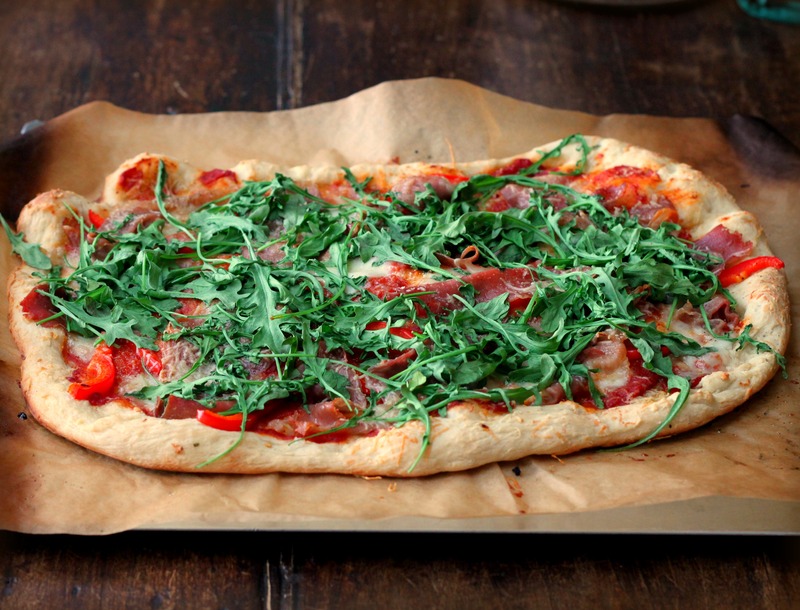 Then look no further for a couple of techniques that will result in delicious homemade pizza. I grill pizzas all year, no matter the weather. It keeps the heat outside on a warm day, gives me an excuse to fire up the grill on a cold day, and consistently results in crispy, chargrilled homemade pizza which is the next best thing to having my own pizza oven. There are 2 basic methods I use to grill a pizza. The first, and easiest in my opinion, is to use a pizza stone. I have a Weber pizza stone that’s designed to fit right on my grill, but you can use any pizza stone that fits. Just preheat the stone over direct heat while you fire up the grill, and go about preparing your pizza. When the grill is nice and hot, slide the pizza onto the stone. Close the grill and cook the pizza until the crust is browned, the cheese is melty and bubbly, and the toppings are cooked to your desired doneness, about 15 minutes. If you want more char and blistering to your crust, the second technique is to grill the pizza directly on the grates. In this case, you should begin to grill the crust before adding the toppings. Lightly oil the rolled out crust, then place over direct heat, oiled-side down. Grill until the crust is nicely browned on the bottom and releases easily from the grates, about 2 minutes. Brush the un-cooked side of the crust with oil then flip the crust over and add the toppings to the top. Close the lid and grill until the cheese melts and the toppings wilt, about 5 minutes. This was the pizza I made over the weekend using the pizza stone method. I often make white pizzas, which means without tomato sauce, and top it with garlic oil, cheese and fresh veggies from the farmers market. It’s a hit with the whole family and great way to get everyone to eat their vegetables. 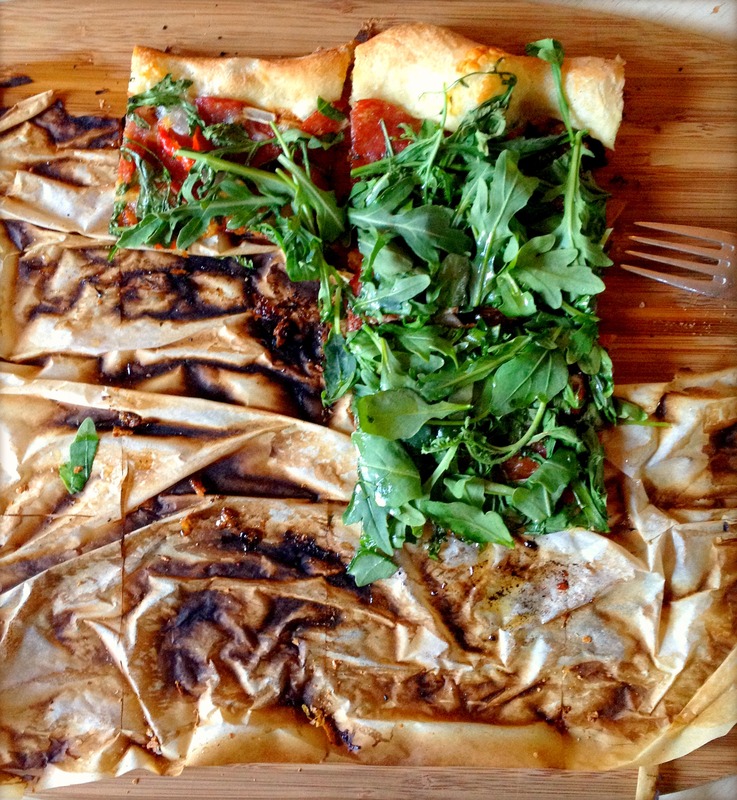 I prefer to roll my pizza out onto a piece of parchment paper for easy maneuvering. You can skip this step and transfer the dough directly to the pizza stone if desired. You can also prepare this pizza in an oven. Makes one large rectangular pizza. Prepare the grill for direct cooking over high heat (about 500°F) and preheat a pizza stone for at least 10 minutes. Roll out the dough to fit the size of the pizza stone (I have a rectangular pizza stone and formed a 10 by 15-inch crust). Lay the dough on a piece of parchment. Trim the parchment to fit the contours of the pizza. Whisk the oil, garlic and salt in a small bowl. Brush the crust with the oil. 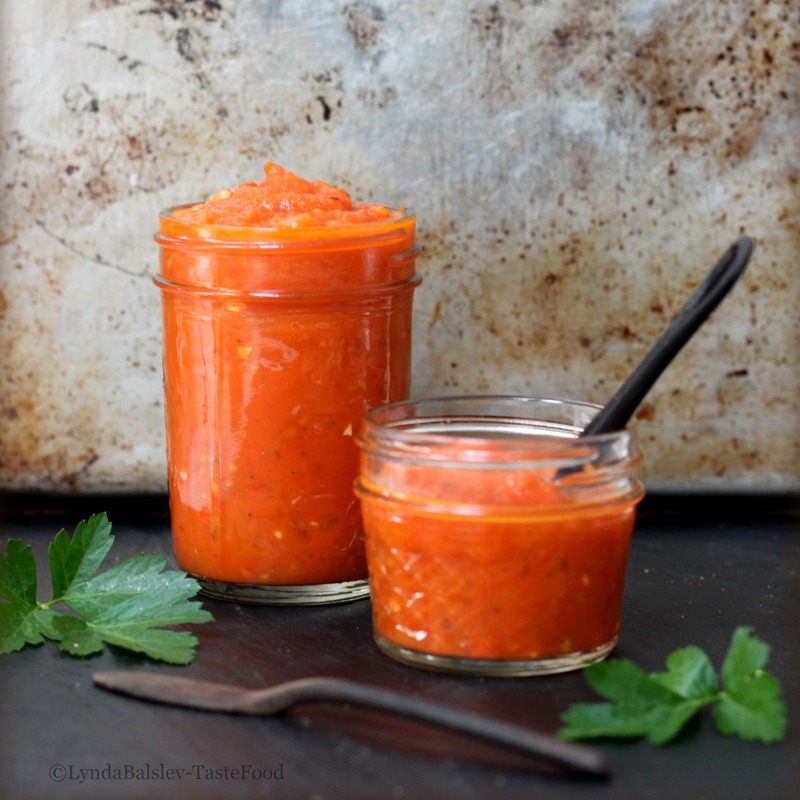 Lightly season with chili flakes, if using. Scatter half of the mozzarella and half of the Asiago over the crust. 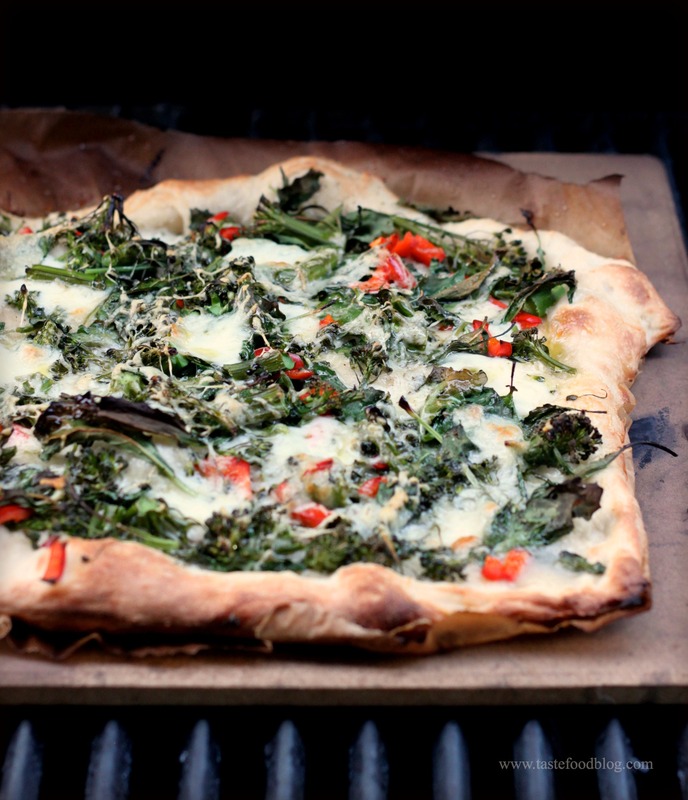 Scatter the broccolini and jalapeno over the cheese. Top with the kale. Sprinkle the remaining mozzarella and Asiago over the kale. Slide the pizza onto the pizza stone. Close the grill and cook until the crust is golden and the cheese is bubbly, 13 to 15 minutes. Remove from grill and drizzle with remaining oil. Sprinkle with freshly ground black pepper. Cut into serving pieces and serve immediately. Stir lukewarm water and yeast together in a bowl. Add 1/4 cup all-purpose flour and the semolina. Mix well. Let stand until bubbly, about 30 minutes. Combine the remaining flour and the salt in another bowl, then add to the yeast. Add the cold water and olive oil. Mix well to form a dough. Turn dough out onto a lightly floured board and knead until dough is smooth and elastic, about 10 minutes. (Or use a mixer with a dough hook, and knead about 5 minutes). Place dough in a lightly oiled bowl, turning to coat all sides with the oil. Loosely cover the bowl with plastic wrap. Let rise in a warm place until doubled in size, 1 to 2 hours. Punch dough down, and let rise another 45 minutes. Divide dough into 2 equal disks. Let rest 30 minutes before shaping.